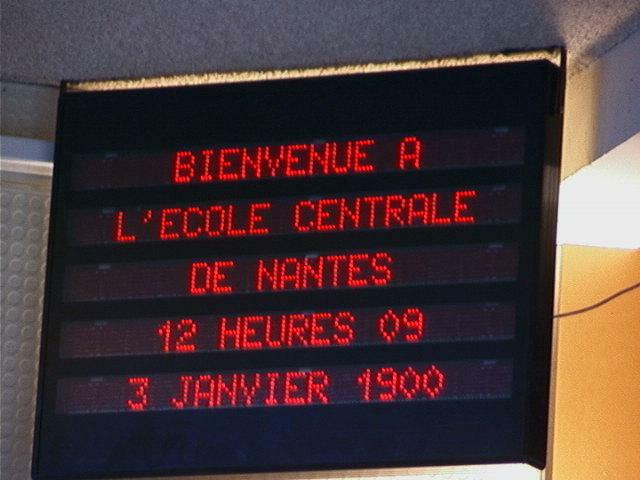 Incorrect Display: 3 Jan. 2000 shown as 1900. The scare started on the partially correct rumours that some computers were not capable of handling four digits hence will turn the dates to 00 leading chaos. That was the beginning of a new era. Information age. However we have not looked back ever since. This is technological aspect of the world we live in. Let’s turn to economic aspect. While USA and USSR/Russia were at each other’s eyeballs, and Japan, the global economic power went into recession, a new economic giant emerged and overtook all. China with its economy poised at ten trillion it is twice the size of USA. Tremors in Chinese economy create ripples across the while word. You would have noticed if you had watched stock/ currency market indexes recently. Skipping the part where USA emerged as an economic power on the strength of Kuwait Invasion by Iraq, the rules of power changed in this century. Untill last century it was the arsenal which proved the power. Now it is the economic capacity to buy the arsenal. Gone are days when an economically weak USSR could look into the eyes of USA on the strength of stockpile of nukes and weapons. Today China is the unipolar sovereign who commands the rest of world. Two months back it devalued it’s currency and cut interest rates. The markets are still assessing the implications. It is other matter that Chinese deny number one status so as not to hurt psychology of USA. Remember BRICKS Bank mostly funded by China? It is aimed to under cut USA controlled World Bank and IMF. How China became such economic power? In 1980’s when India was still debating the role of computers and benefits of market economy, Chins had sent out its ministers for industry and commerce to every major western Industrialists. This ministers would invite industrialists to manufacture in China with Chinese labour. Chinese labour had always been part of nation building in USA as cheap immigrant labour in 19th century. These minister would give turnkey project approvals at the doorsteps of industrialist. In the next 30 years while we are again stupidly debating Cow and Hindutva, PM Modi is trying to emulate China with his ‘Make in India’ programs. New industries means new jobs. With 55 millions unemployed India needs new jobs more than ever. Previous Congress Government came to power on the plank of growth and job creation. When it won second time in 2009, the stock markets break world records of acceleration in a few minutes. sensex rose by 1000 points. But Manmohan Singh did nothing or little to resolve the core problem. Instead he followed leftist/communist policies of doling out more subsidies to poor. Have you ever marketed a product? Ever launched a new business? If No, you wouldn’t understand. When you need business or want to sell a product, you have to market it. One may have to travel door to door. With all the advantages of the product and packaged in attractive wrap. Modi is marketing Brand India. 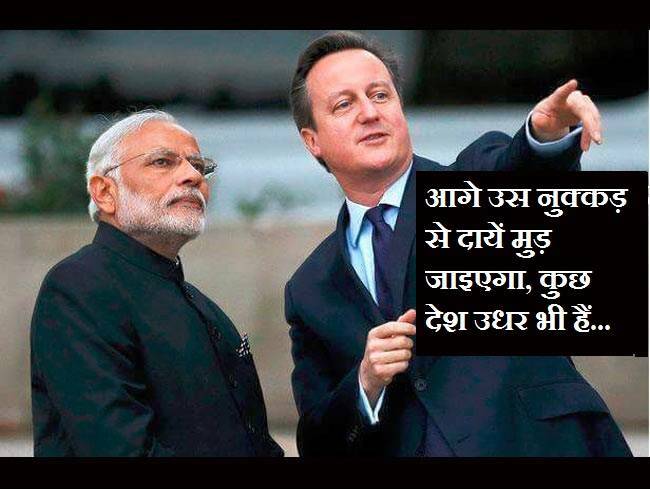 Like a salesman he is visiting country to country to sell Brand India. Come, make in India and sell in India. He did it everywhere. Last month it was silicon valley. Today it is Landon. We are importing manufactured goods from China worth 65 billion dollars while exporting 10 billion dollars only. (not sure about exact figure but ratio is similar) The difference shows the market which exists in India and on which world is salivating. This market is existing and with more jobs it will increase exponentially. In fact Modi is doing less. It would be better if he appoints two or more ministers for foreign investments. These ministers should make follow up visit after Modi and ensure approvals etc for those interested to do business in India. These ministers should coordinate with State Governments as well. It will also save him from criticism he is facing in respect of foreign travels and may create more confidence in investors. This entry was posted in Finance, Politics and tagged Modi foreign travels, Narendra Modi. Bookmark the permalink.